In the digital era, Internet has considerably changed the consumption landscape, and, in consequence, the way companies interact with their consumers. In other words, consumers have shifted primarily to the online environment, which has required companies to adopt an ‘engagement-based marketing’ (Mercer, 2014). However, in the B2B environment, the situation is different. According to Rodriguez et al., “B2B e-commerce is valued at more than three and half times that of B2C e-commerce”, but “the interest in, and subsequent adoption of, social media by B2B organizations has been slow compared to their B2C counterparts.”(2012, p. 36). This behavior is influenced by the particularities of the target group, communication channels and buying criteria of the B2B world. At this point, industrial companies still prefer traditional media such as newspapers and magazines to social media (Winer, 2009). On the other hand, according to the Harvard Business Review Analytics Services, a tendency in using more digital marketing instruments was noticed among B2B enterprises (2010), which demonstrates that a revolution in B2B social media is not that far away and that companies should be prepared for it. The digitalization trend in the B2B environment is positively viewed by Millennial generation, which is considered to be the promoter of digital change on the corporate level (Schultz et al, 2012). In this context, Millennials stand for social media as an efficient branding tool that can acquire new customers for the company, as well as advertise its image and products (Schultz et al, 2012). Despite these advantages, managers, mostly from generations X and baby-boomers, still think that face-to-face selling works best in B2B relations, which holds them back from fully exploring online opportunities (Järvinen, 2012). 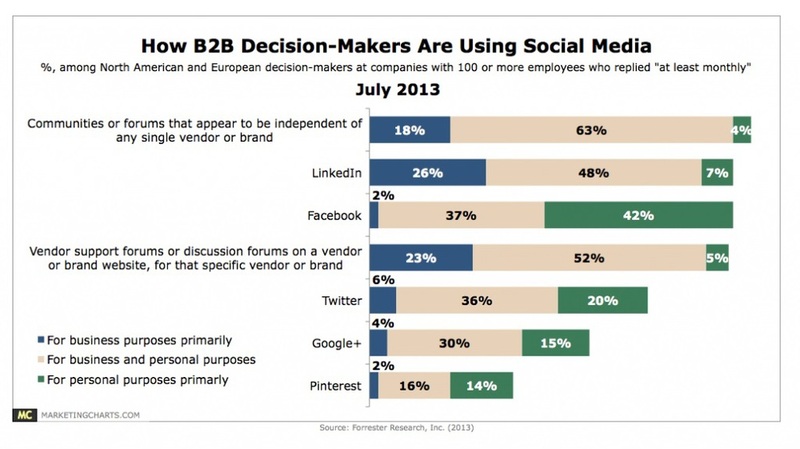 The lack of understanding of digital networks slows down the implementation of social media in B2B companies. This point was listed to be among the reasons why there is so little research in the field of B2B social media (Jussila et al, 2014, Leek & Christodoulides, 2011). Saying that, I am questioning myself whether, in our days, the target group in B2B is that different from the one in B2C to the extent that it requires only traditional marketing approaches; what makes the social media in B2B so difficult to embrace and hard to understand? In order to answer these questions, in this blog post I will try to determine the particularities of B2B social media, its similarities with the B2C social media as well as what B2B can learn from B2C experiences in this regard. In order for a social media tool to be successfully integrated into an organization, managers need to understand what it represents and why the obstacles listed above can be actually adapted to the online environment for the benefit of the company. (Schultz et al, 2012). In this regard, I will concentrate my further discussion according to the three B2B social media vulnerable points: target audience, communication channels and buying criteria. The main critique of social media in the industrial field is that it cannot build strong relationships between companies and their clients. As stated before, B2B managers believe that personal interaction lays at the basis of all their business deals. However, the time has changed, so did the requirements of B2B clients. Now, they are looking for the best products at the lowest price possible and devotion to only one supplier is not a solution anymore. In order to find out this information, besides using their network of contacts, B2B clients have also turned to the World Wide Web. So when a human from company X gets online to search for possible business-partners or business offers – how does he/she differ from a B2C consumer? In this situation, the business-to-business costumer becomes a ‘human-to-human’ (Sood & Patisson, 2012) one – shortly, a perfect target audience for social media. Another similarity between B2C and B2B clients is the need of both to trust and know the company before buying its products. This is why, Leek and Christodoulides argue that B2C and B2B brands, despite the differences between them, should both concentrate on the development of “cognitive and affective ties with stakeholders” (2011) and the best way to do it is through an integrated multi-channel communication and marketing strategy. As a result, the B2B client becomes a target for corporate branding – an ordinary practice within the B2C field. All of the above demonstrates that a B2B client can be approached online and it will definitely benefit the B2B enterprise, especially if also combined with the traditional marketing practices. The only difference between these two consumer categories is the communication style that should be adopted when creating the social media campaign. Teresa Basich in her article “B2B vs B2C Buyers: 3 Key Differences That Impact Social Media Use” states that B2B buyers are less emotional, cannot be mass targeted and require a special attention to details (2013). Therefore, B2B companies should use a professional vocabulary and communication tone when interacting with their clients. Even though an offline relationship is transferred online, it does not mean it should lose its previous style. In social media everything should be targeted and the communication channels used to reach the clients are not an exception. Rodriques et al affirms that one of the biggest struggles in B2B sales it to get to the decision makers of their prospective clients (2012) (which is actually much easier if you are a B2C company). In the offline world, there are several methods to reach to the decision makers, but most often this path lays through the secretary’s mailbox or phone (which doesn’t guarantee an eventual reply from the desired person). In social networks, however, there are no space or human boundaries. Everybody can connect to each other at any time (Hanna et al, 2011), which makes the process of reaching decision makers as easy as reaching a B2C consumer through digital media. According to Figure 1 below, the most popular social networks that B2B decision-makers use in business related activities are: linkedin, vendor support forums and online communities absolutely not connected to their activity field. By entering these social networks with interactive messages, B2B companies can get in touch faster with the desired customer. Moreover, an active social presence of the company online can create the phenomena of “networked familiarity” (Rodriguez et al, 2012) which means that customers get a feeling that they know the company representatives from the outside of the web. However, even though in B2B it is more difficult to select the right networks for social media than in B2C, there are still brilliant examples in which companies went out of the box and proved that social media has no limits. Such an example is Adobe Systems and its product Adobe Marketing Cloud. It is worth mentioning that Adobe operates on the B2C market as well, but the largest part of its revenue still comes from the B2B business, and specifically from commercialising Adobe Marketing Cloud. What surprises me about the online promotion of Adobe Marketing Cloud is that…everybody can see it! Adobe does not use particular professional social networks to reach its target consumer, but produces viral videos, which are fun and emotionally engaging, and uploads them on the most popular online channels. One of these videos is Click, baby, click! Adobe understood that big industrial players are normal people that have the same habits as everybody else: play with children, watch TV or Youtube videos etc. This example shows that social media is a magic tool that can do everything, it just needs to be understood. Another outstanding example is General Electric that has Pinterest and Instagram pages – channels traditionally believed to address B2C consumers only. Despite the fact that the majority of existing literature affirms that branding is an effective tool for expanding business operations, for both B2B and B2C enterprises, (Järvinen et al., 2012, Jussila et al., 2012, Shenna & Christodoulides, 2011), Leek and Christodoulides, in their study about the major buying criteria in B2B environment found “branding to be secondary to pricing, logistics, and service” (2011, p.831). A lot of managers might think that this statement supports the idea that social media is not that important in B2B environment. However, I would like to argue and say that, if branding is really not important when choosing a B2B supplier, there is still a need to send the sales offer to the consumer, and the easier way to do it, without getting into offline marketing barriers, is through social media. In this case, only professional social networks can be taken into consideration. However, from B2C example, we can see that companies that ignore their brand image are not as successful as their counterparts that implement an exclusive branding campaign. B2B organisations might not be as sophisticated as B2C companies in this regard, but in the context of increasing competition, branding might help them stand out from the crowd. The above analysis has demonstrated that the B2B environments has evolved and it has a lot of similarities with the B2C world. Among these are: the need of target audience to be approach on a human-to-human level; the need to target communication channels within the social media campaign and the importance of branding in attracting new customers and maintaining the old ones. However, there are still B2B social media particularities that companies should take into consideration when creating their digital media strategies, such as: B2B companies require a professional, serious attitude; communication channels, besides branding, should be also used as a networking and sales tools and third, client companies are not persuaded by branding at the extant at which are consumers in the B2C environment. Even though managers are afraid to rely on social media, data shows that it is gradually invading the B2B space, which means that soon, the target consumer, communication channels and buying criteria will be even more similar to the ones in B2C. Some companies have already taken the lead in this social media competition and will definitely become as an example for other industry players. As long as there is still some time to the social media revolution in the B2B sector, I suggest companies to learn from the B2C representatives that already have a rich experience in capitalizing on social media. First, B2B companies can initiate a blog and continually update. It is difficult to find relevant and interesting content all a regular basis, especially if the company is operating in a static industry, but it can also share success stories about their successfully closed deals etc. It is really important to have one person, or an entire team, to manage the social profile of the company. Only then the company can get everything out of this experience. Moreover, B2B companies should not be afraid to get out of the box and try innovate their social media, like Adobe or other companies. However, I researched the subject from a general standpoint of view. In this regard, a further interesting question to discuss would be: Are there any particular B2B industries in which social media cannot be used at the degree discussed above? How does the industry pre-determine the usage of social media? Can B2C practices be implemented in all B2B companies or not?